The 64-year-old Davies has made a scant four feature films over the course of three decades, plus a trio of short and semi-autobiographical films he made at the beginning of his career. His first feature film, Distant Voices, Still Lives remains his most famous. A very personal film based on his family in Liverpool, the film took Cannes by surprise in 1988, when critics praised the filmmaker’s original vision. 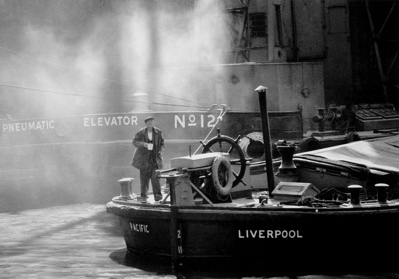 Mr. Davies has come very close to a re-iteration of that film’s lyrical power with his latest film, and he returns to the city of his youth with a filmic ode to Liverpool that is both elegiac and cantankerous—the way of all old men looking back. Taking more from the personal essay than the traditional documentary, Of Time and the City is made up almost entirely of found footage that illustrates the memories of the life Davies knew, starting with life in the port city and its inhabitants just after World War II and ending in the year 1973, when he moved away. Most of the footage is from old newsreels that show, at least in the first half, the people of the era, old and young, working and playing, walking or just sitting. There are many very moving shots of old people, their wrinkled faces and slow-moving bodies serving as reminders of time passing. Juxtaposed to this filmic collage of images, Mr. Davies has placed a soundtrack that switches intermittently between voice-over and music. Mr. Davies’s own rich and expressive baritone voice provides the voice-over, much of which consists of his personal musings about his past and the times he lived through. His narration is filled with quite candid and opinionated thoughts about his Catholic upbringing and his subsequent rebirth as an atheist, the rampant poverty of postwar England, his homosexuality, his love of movies, the Korean War, the ridiculous (and costly) fanfare of British royalty, and his disgust at the municipal architecture that turned the outskirts of Liverpool into unsightly low-rent housing. Interspersed with these musings, Davies also recites whole passages from poems that he loves. The film is like an anthology of Mr. Davies’ favorite poems, and those literature majors in the audience should recognize many of them. Mr. Davies once said that he read from T.S. Eliot’s massive Four Quartets on a daily basis, like one reads the Bible. Of course, Eliot is among the chosen here. Of Time and the City also includes an anthology of Mr. Davies’ favorite music, and it is here that I found the movie most evocative. When Mr. Davies is not speaking, music fills the soundtrack, long stretches of music (whole songs are often played), mostly from opera and the classical canon, but there are a few popular songs as well. Mr. Davies is one of those great lovers of music who have no compunction in sharing their love with the world, and so he offers us his passion with a strange mixture of fervor and artistry. His taste is exquisite, and I, for one, was transported by his choices. But does great music make a movie great? Without the music, I wonder how this film would hold up? Mr. Davies is certainly a passionate man who has a wonderful artistic temperament, and there are many moments when Of Time and The City illustrated the force of that temperament. But even at its spare 74-minutes, I started disengaging. At times I wished I could have actually seen these magnificent singers performing. But that would have been a concert film, which is about as far from the filmmaker’s intent as you could get. The images of people were remarkable visionary equivalents, and they stood their ground with the music in a kind of symbiotic union. But some of the images just weren’t strong enough for me to put them in equal measure in my consciousness with the songs, especially the shots of the drab postwar architecture that seemed to go on forever. Still, it is a small complaint about what is otherwise a beautiful film. Terence Davies is one of those few extremely independent filmmakers whose movies are cut from the material of their souls. Jay Rosenblatt is another, but there are many out there, showing their highly personal movies at film festivals. Of Time and the City is one of those movies, and it’s good to see Mr. Davies is still around, still doing his art.